We’ve had a new addition to the family – last week I was able to visit my lil sis, her son and his wife, and a brand new baby grand-nephew. It was truly a week of excesses, traveling, graduations, Memorial Day. I made my Mixed Berry Shortcakes, and indulgence for sure. My nephew (a talented musician) is a vegetarian, and when I got home, I dusted off my old recipe box and pulled out a favorite from the 70’s: This brown rice and vegetable casserole. It is truly a tasty vegetarian meal with wide appeal. Here is a gorgeous, bountiful dish that vegetarians and carnivores alike will eat with relish. An extra step or two and a little care was all this recipe makeover needed to ensure each and every component of this dish shines. This, as a matter of fact, is my “go to” method of cooking brown rice, in the oven, in a tightly covered casserole. No stirring, no scorching, no mush. This recipe may be halved, but the cooking time really remains pretty much the same. Saute onion in butter or oil in a large skillet. (If your onion becomes a little dry, add a tablespoon or so of water.) Remove half the onion and set aside – you’ll use it for the vegetable topping. Add brown rice and stir until the color just begins to change – you’re not looking to brown it, just coat all the grains with the butter. Add the three cups of broth, soy and thyme, stir together and place in a large casserole. Cover tightly and put in oven. Set your timer for 60 minutes and check the rice – it may take more time, up to about 70 minutes depending on the brand of rice, the shape of your casserole and your oven. You will want it to be still firm but tender. When your rice has been in the oven for about 40 minutes, prepare your vegetables. Add the olive oil to your skillet, break and cut the cauliflower into bite sized florets and add them to the skillet (they take the longest time to become tender) stirring now and then. Once they have just a little browning, do the same with the broccoli and saute for a minute or two longer. Cut the peppers into a bite sized dice and add them, along with the onion. Add the 1/2 cup water and put a lid on the skillet, and simmer for about 5 to 7 minutes. Remove the lid – the vegetables should still be slightly crisp, but almost tender, and the water almost gone. (They are going to cook for a few minutes longer, so err on the crisp side.) Add in the garlic and salt and cook for about 2 minutes more. Taste and reseason if you’d like. When the rice is done, spoon the vegetables and any remaining liquid over the top. Sprinkle with cashews and cheese and return to the oven just until the cheese is melted, about three to five minutes. Watch it carefully at this point – you want it in the oven for the minimum time it takes to just melt the cheese, and you don’t want to dry out your vegetables. You can certainly use almost any vegetable you’d like in this dish. Teriyaki is a good substitute for soy for a different flavor. You can use oregano instead of thyme. Almost any kind of cheese will work – If you want a gooey, melty cheesy casserole, you can double the amount of cheese – I like to use just enough to entice my teenager into eating the vegetables while still maintaining some healthful aspects to the dish! A large casserole with leftovers (yeah!) that’s still pretty healthy. 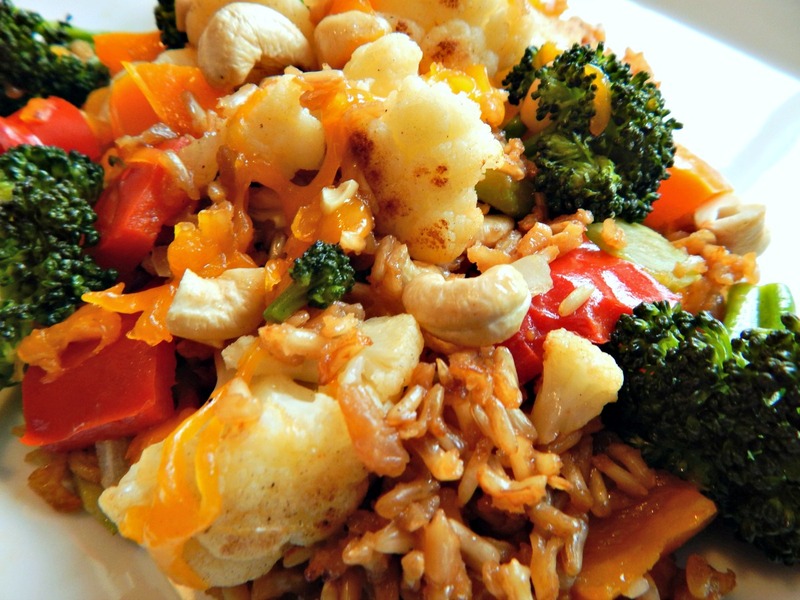 This entry was posted in Click here for Bargain Meals, Click here for Fabulous Food Posts and tagged Bargain Meal of the Week, Bell Peppers, Broccoli, Brown rice, Casserole, Cauliflower, Cheese, Easy Recipe, Frugal Hausfrau, hearty sides, Nuts and Seeds, Rice, Vegetarian Meal. Bookmark the permalink.